Oh, it's the time of year for gift cards (at least in my family)! I always try to find different ways to package gift cards because otherwise it just seems kind of boring. This gift card holder is made from the small open end envelopes that are on page 167 of the catalog. 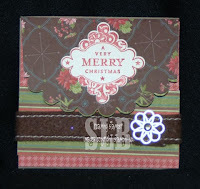 I used the kraft ones as I felt they went best with the Holiday Treasures designer series paper. I also used the large scallop circle die for the Big Shot on this. It just made it look prettier. When it's opened, you can slip the gift card inside and write a little note on the envelope. All products (except gift card, and velcro dot) from Stampin' Up! Love your color scheme on this project. Very pretty papers with this design. I agree - it is so much more fun to give a gift card in a fun package than just inside a card! Yours look great!! Fabulous idea!